The world is animated by its own elemental potency that sways the bow and pushes up the crocuses each spring. And the world is energized by each person whose thoughts and feelings charge our common atmosphere. At the convergence of these two domains, the natural and the human, are the paintings of Tiko Kerr. In them a kind of conceptual algebra operates in which the categories of energy become equivalent, allowing us to ponder the equal sign connecting them : the constant movement between the observable and the invisible, between what we know and what we sense is real. In Kerr’s paintings, he has moved from paintings of urban life, to the great totems of the First Peoples of the Pacific Northwest, to iconic images of nature, to dense abstract drawings, and most recently to a series of evocative interiors, titled Felt Absences. Rather than just a roll call of an artist’s subjects, we can see them as one man’s journey through the life immediately around him, charged with a sense that the world itself is alive. The totem paintings loom up before us, silhouetted against the sky, too large to take in all at once. They are full of a primordial spirituality, an age-old connection between nature, a people, and their religious tradition. 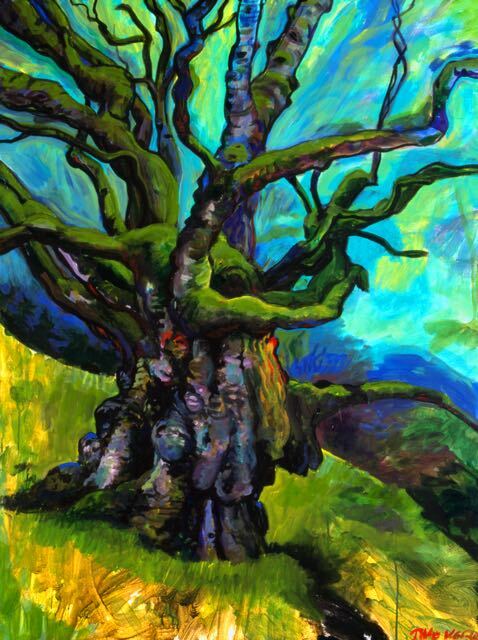 These awe-struck images prepare us for Kerr’s way of approaching nature: heroic stumps or twisted old trees, like The Great Elm, which carry in them a kind of wisdom about perseverance through suffering. For Kerr, nature is not a fixed image, but something always in flux, wavering in the light, inflamed with color. And in his paintings, color itself is heightened, amping up the experience of seeing, until we begin to understand that Kerr is telling us not just about the appearance of things, but about the possibility of ecstacy. In a series of black and white drawings, the mood becomes introspective, and at times anguished, with a sense of transiting the heart’s dark interior on crisscrossed white lines. This feeling is externalized in the searching interiors of Felt Absences. Kerr shows us plainly the medical examination room’s cold fluorescent light and dark shadows in blunt, forceful strokes. He bring us into the hospital room, the bed glowing and formal like an altar, before a cruciform window that reveals the night. He gives us an empty, sunlit room from which we glimpse a church’s rose window. In all of these paintings Kerr reveals his confrontation with the emotional reality of dealing with illness, sparing neither himself nor the viewer the anxiety and the starkness that is there. And he does not allow us to turn away from what is also unseen and unpaintable, a sense of mortality and of hope. John Mendelsohn has written articles and reviews on contemporary art for Cover Magazine, ArtNet Magazine, and The Jewish Week, as well as essays for exhibition catalogues. He taught at Illinois State University and the University of South Florida, and he currently teaches in the Studio Art Program at Fairfield University in Connecticut. He has contributed entries to the forthcoming book, A Dictionary of Symbolic Images, to be published by the Archive for Research in Archetypal Symbolism at the C.G. Jung Institute, New York.